A few days ago, I saw a poll on facebook, asking people what areas still need coverage regarding the war. Well in front of the pack was the subject of Reconstruction. It had always been my conclusion that the subject, at least dealing with North Carolina, was pretty well covered. Of course, there is always room for a new book or two. I personally would like to see a book on the role of North Carolina's courts and/or the General Assembly during the time period. There have been (to my knowledge), three books published on Reconstruction in North Carolina, and another that covered the era (think general history). The first was J. G. de Roulhac Hamilton's Reconstruction in North Carolina (1914). This was followed by Richard L. Zuber's North Carolina during Reconstruction (1969). Then came Paul D. Escott's Many Excellent People: Power and Privilege in North Carolina, 1850-1900 (1985). 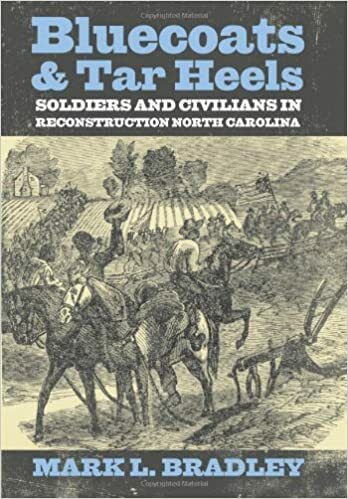 Finally, Mark Bradley's Bluecoats and Tar Heels: Soldiers and Civilians in Reconstruction North Carolina (2009). The last book is a superb treatment of the time following the war. There are also several biographies of various people involved. Richard Zuber's Jonathan Worth: A Biography of a Southern Unionist (1965) is a good read, as is William C. Harris's William Woods Holden: Firebrand of North Carolina Politics (1987). Gordon McKinney's Zeb Vance: North Carolina Governor and Gilded Age Political Leader (2004), is, in my opinion, the best biography on Vance published to date. Biographies I must confess that I have yet to read, but that might hold promise, are Donald Connelly's John M. Schofield and the Politics of Generalship (2006) and Otto H. Olsen's Carpetbagger's Crusade: The Life of Albion Winegar Tourge (1965). Also in the line up are Roberta Sue Alexander's North Carolina Faces the Freeman: Race Relations during Presidential Reconstruction, 1865-1867 (1985), and Richard Reid's Freedom for Themselves: North Carolina's Black Soldiers in the Civil War Era (2008). So, what have I missed? What would like add to this list? Is the coverage of North Carolina during Reconstruction adequate?